When dogs get bored they can develop some destructive behaviors. For thousands of years we’ve bred dogs to work alongside us so they’ve developed quite a work ethic. The problem is most of us don’t have actual jobs for our dogs to do. They don’t have to work for their food, our affection or toys; they get it all for free. Getting stuff for free is great, but it leaves many of our dogs with a lot of down time. So what happens when our dogs get bored? They get into trouble. If we don’t keep them mentally simulated or busy they’ll come up with their own ways to pass the time, and you’re probably not going to like their idea of a good time. 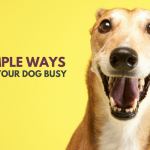 Luckily there are a few simple ways to keep your dog busy, entertained and out of trouble. 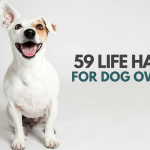 Here’s 26 quick & easy ways to relieve dog boredom. Is your dog bored? Dogs that are bored tend to get into trouble by looking for ways to entertain themselves. 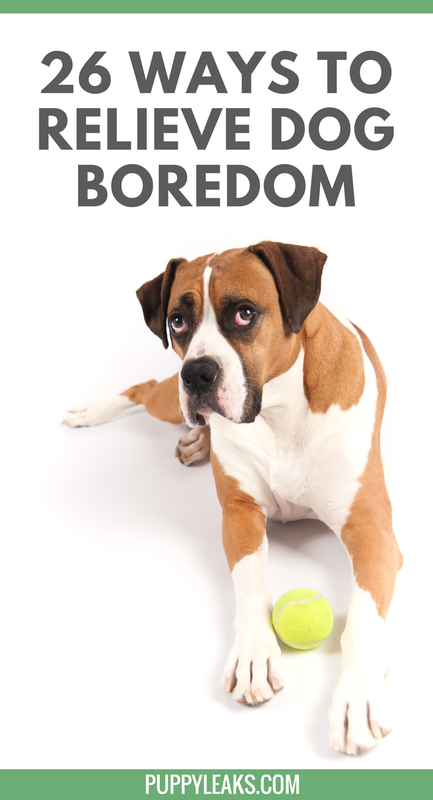 Boredom can lead to excessive chewing, barking, digging, and other destructive behaviors. Our dogs were bred to work alongside humans, so without proper stimulation they can easily become bored. Instead of having a job to do most of our canine companions are left alone while we work – and then when we get home we hand them a free meal. That’s great for couch potatoes, but many of our dogs are left with a lot of excess energy at the end of the day. They need boredom busters & activities to occupy both their bodies and minds. Luckily there are a few simple games you can play, toys you can try, treats you can make, and tricks you can teach to quickly relieve your dogs boredom. To keep your dog fit both physically and mentally you’ll need to come up with some interactive activities and dog toys to enjoy together. Whether you have a young or old dog, big or small – they need entertainment. From a simple game of fetch, working on obedience, or a trip to the local park; it’s up to you. A recent study found that dogs that don’t engage in a lot of play exhibit more behavioral issues such as anxiety and aggression. With so many great and simple choices it’s just a matter of finding a few that suit your lifestyle – and making the commitment. From choosing toys that will keep your dog busy, or changing up your walking routine, there’s so many possibilities. I notice a huge difference in my dogs behavior after a simple obedience training session, it doesn’t take much time and it’s enjoyable for the both of us. An active, mentally challenged dog will make for a thriving, happy, and less destructive companion. Hiding treats around the house or playing a game of hide and seek with your dog is a fun way to add in some extra mental stimulation to their routine. It’s one of the most versatile games you can teach your dog. Start off with a simple game of ‘guess which hand’ to get them started. It can be played anywhere, with toys or treats you already have. Tug is a great way to mentally & physically challenge your dog. Short games of tug work wonders for tiring out our canine friends. Minute for minute a nice game of tug is one of the most physically & mentally challenging games you can play. And contrary to myth playing tug of war with your dog will not make him aggressive. If you don’t have a tug toy you can make your own with some fleece or old t-shirts. Tip: Tug is a great interactive game for dogs, but there are a few basic rules to follow to keep it safe and fun. Daily walks can get a little mundane if you’re going the same route everyday. Switch it up by exploring new neighborhoods and changing your pace. Allowing your dog to smell their surroundings adds mental stimulation. They’re not just visual creatures – they learn a lot from all those interesting smells. Giving them the opportunity to sniff around adds a lot of great mental stimulation. Tip: Does your get dog have good leash manners? If not check out these 10 dog walking tips that make for a better dog walk. Using food dispensing toys, such as the Kong Wobbler and Bob-A-Lot Treat Dispenser, are an easy way to give your dog some more mental stimulation. There’s also a lot of great DIY toys you can make from items around your house like the great dog bottle game. Interactive dog toys are a great way to keep your dog occupied and mentally stimulated. Going for a hike, playing with a Kong Wobbler, and playing a game of tug are all simple ways to keep our dogs entertained. And contrary to the old myth playing tug will not make your dog aggressive. Training your dog any new command gives their brain a workout. A few 10 minute sessions a day working with your dog on new tricks or commands burns a lot of mental energy. Teaching your dog a reliable recall & working on impulse control are some of the important basics to master – it’s always a great starting point. Sit, lay down, shake, stay, and come here are the basic commands to start with. Have them help out with your chores or everyday routines. I’ve taught my dog Laika how to do some chores around the house. She helps me load laundry baskets, she knows how to clean up dog toys, and she’ll carry sticks and logs out to our wood pile. Incorporating your dog into everyday tasks can help relieve boredom. It also helps build their confidence; a dog that feels useful is a happy, confident dog. Find jobs for your dog that fulfill their breed tendencies. Retrievers tend to love fetching and Border Collies usually excel in agility. Find out what your dog absolutely loves doing and make it into a job for them. I personally love lure coursing for dogs – you can even set up a simple coursing track in your own yard. It’s a great way to burn off a lot of mental and physical energy, and if your dog loves to chase they’ll love lure coursing. If your dog likes to pull and you’re handy consider building him his own dog cart. Give your dog some meaningful interaction by having a dog play date with your friends or family. If there’s some friendly dogs in your neighborhood even better – no need to make any special arrangements. Introducing new toys, socializing, and changing up your walking routine are great ways to keep your dog mentally stimulated. If your dog loves digging build them their own personal digging box in your yard. Bury toys in it and let them find it; some dogs love digging so much this can keep them entertained for hours. Any big ball toy can be a lot of fun, and jolly balls just tend to be more durable than a soccer ball (if your dog is a tough chewer make sure you get one without a handle). Some dogs love playing with these all by themselves, but of course you can always make it more interesting by playing with them. I don’t quite understand the allure of these magical items, but Laika goes insane for her red jolly ball. Clicker training your dog can be used for training new behaviors and rewarding ones you didn’t even ask for. It’s a way to clearly communicate with your dog the exact moment they perform a desired behavior; all the extra mental stimulation makes for a tired doggie. Dogs are always learning from us – just teaching them where to sit while you prepare dinner is mentally stimulating and enforcing good manners. Shaping is building a particular behavior by using a series of small steps to achieve it. Letting your dog make their own choices burns an amazing amount of mental energy and helps your dog develop learning behaviors. Studies have found that by using positive training techniques such as shaping help a dog learn to make better decisions in the future. Check out Dr. Sophia Yin’s excellent video demonstrating free shaping. Exposing your dog to new people and places is an important part of puppy socialization. It’s great for older dogs, too. Just like any behaviors a dog that isn’t exposed to new sights, sounds, and places can get a bit rusty. Work on their social skills every once in while with some new dogs and people. Most dogs love nose work games, playing outdoors, and taking a trip to local beach or lake. When you leave your dog at home give him a stuffed Kong or another tough interactive toy to keep his mind occupied. One of Laika’s favorite things in the world is a frozen peanut butter filled Kong. When I leave she doesn’t even look up; she’s too busy working on that Kong. I’d recommend a Kong to anyone that’s looking for a simple toy that will keep your dog busy. Tip: Not sure what to put in your Kong? 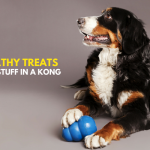 Check out 39 healthy foods you can stuff in a Kong. A lot of dogs naturally love water; on a summer day these dogs will love just splashing around and wading in a shallow pool. If you live by a dog friendly beach or lake even better. Many dogs love a good swim – not just Labs. It’s an amazing exercise for dogs with arthritis since it’s low impact. If your dog’s home alone for long periods of time consider hiring a dog walker. If you don’t want to hire someone see if one of your neighbors, relatives or friends would be willing to stop by every once and a while to let your dog out for a nice walk or game of tug. You can freeze dogs treats in ice or make some ice cubes from broth. Just like a stuffed Kong, frozen dog treats are a great way to occupy your dog when you leave the house or need to do some chores. If you have a full sized Kong it’s pretty amazing how long they can keep a dog occupied. Dogs are social creatures. A nice belly rub, massage, or grooming session is an easy way to create a meaningful interaction with your dog. According to studies dogs get bored with the same old toys. To keep your dog interested in his toys only give him access to a few at a time. My dog Laika only has access to a couple toys at a time – when we swap them out her enthusiasm for her older “new” toys is high. Keep them interesting by playing a simple game of fetch or tug, interaction will always make a toy much more desirable. If your dog is a tough chewer like mine consider some Kong or West Paw Zogoflex toys – they’re the only toys my dog hasn’t been able to chew up. If it gets dark before you get home from work there’s glow in the dark dog toys available. Playing fetch is one of the simplest ways to engage with our dogs. Dogs like to know what’s happening outside so give them a chance to scope out the yard. A lot of dogs love napping in the warm sunlight in front of windows. Of course if you have cats they might have to compete for the nice sun spot. When it’s time for his meals you can use a treat dispensing toy or simply make him do a few tricks to work for it. If you feed kibble you can also try hiding pieces around the house. Studies have found that dogs prefer earning treats to simply being given extras. It goes back to the fact that dogs have been bred to work alongside us; working is not only something to keep the occupied – it gives them a purpose. Not all dogs are naturals at relaxing. The relaxation protocol is a useful technique to teach your dog to sit and stay in a variety of situations. Sometimes a nice simple belly rub is enough to soothe and relax your dog – it’s also a great bonding experience. It’s a rod with a lure on the end and many dogs love chasing after them. You can make your own with PVC pipe, bungee cord, and a toy for the lure. Word of caution; flirt pole chasing can be really hard on a dogs joints so keep sessions short and don’t play with dogs under 1 year of age to avoid growth plate injuries. If you’ve got a muffin tin and some tennis balls you can make yourself a dog puzzle right at home. Here’s 6 simple DIY dog toys you can make at home. Get some chew Toys, bones, or Bully Sticks. Most dogs love chewing, but be sure to keep an eye out for their safety. If they start to break them into pieces they become a choking hazard. Our personal favorite chew toys are Benebones – they’re durable, tasty & generally less expensive than antlers or bully sticks. Give your dog their very own agility course to brush up on obedience and teach them some fun tricks. Weave poles, a ramp, tunnel, or just a simple jump. You can create your own complete course for roughly $175. Looking for some more creative ways to keep your dog entertained? 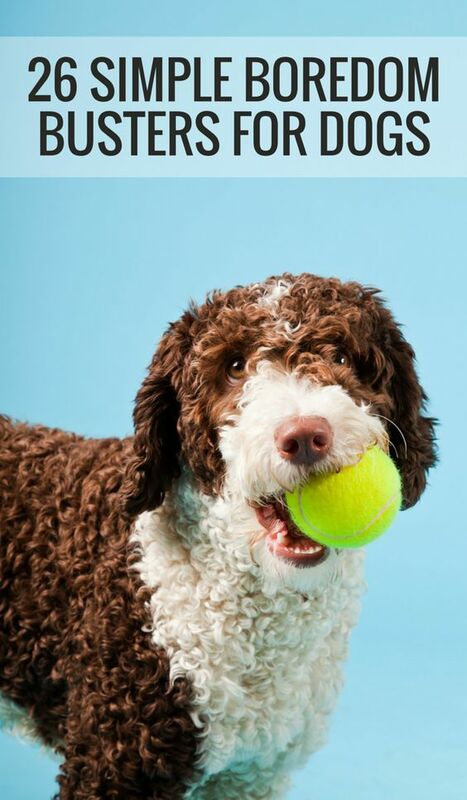 Check out our list of 33 simple ways to keep your dog busy indoors. To keep your dog mentally and physically challenged give them some fun activities to do. Spending a little bit of extra time making sure your dog gets some meaningful interaction leads to a happy, healthy dog. Dogs aren’t natural couch potatoes; they’ve been bred to work alongside humans. Relieve dog boredom by giving them something to do. With a little bit of imagination you can come up with all sorts of ways to help keep them entertained and busy. Guests often laugh when I say “time to do laundry” and my dog readily jumps up and gets excited. There’s nothing wrong with getting your dog involved with your everyday chores; I even make my dog Laika bring me her leash when it’s time to go for a walk. She eats her meals out of a Kong Wobbler; partly because she scarfs down her food quickly but mostly to keep her mind engaged. She helps me in the garden – she’s excellent at collecting wood for the firepit. Simple little tasks throughout the day really do add up. What do you do to keep your dog busy and entertained? How do you relieve dog boredom? Any special treats or games? Looking For More Ways to Keep Your Dog Busy? 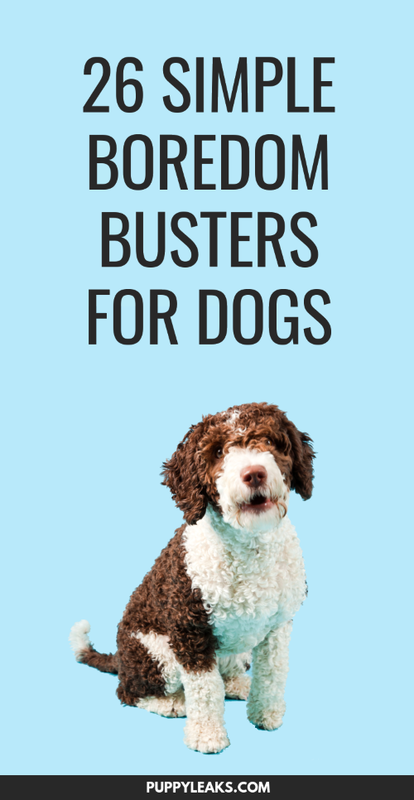 Looking for more boredom busters for your dog? 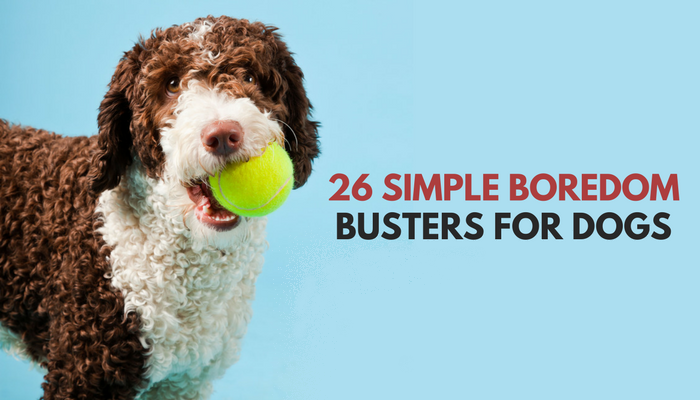 Check out our list of 33 Simple Ways to Keep Your Dog Busy Indoors for more ways to keep your dog happy, entertained and out of trouble. Great post!!!! I do many of these things to keep the huskies entertained! Thanks for the tips – I will have to send this off to Taj’s mom to alleviate her boredom. Thanks, it’s funny whenever we come home with a box Laika pretty much assumes it’s for her. I actually start to feel bad when we get a package at home and it’s not for her lol. It does make for the best day ever when new toys arrive. Stuffed Kongs are at the top of our list of things we give out for Veruca and Ava to entertain themselves. But we also play a lot of fetch and have tried a couple of variations on nose work in the house when it is raining outside. Obedience drills are always fun too. My dog will ignore everything if she’s given a stuffed Kong, it really has some sort of mesmerizing effect on her. Fetch is always fun, and she loves nose work, too. That is the most comprehensive list I’ve ever seen. This is one to bookmark! Thanks so much, I keep thinking of more to add as well. Luckily keeping dogs busy has many options. Great post! I like how you mentioned both play and training options as ways to engage your dog and relieve boredom and strengthen the human canine bond. Either way works and hopefully its all fun. Thanks for the mention of our DIY dog toy. No problem at all – it’s an excellent example of how with a little creative thinking we can all do a bit more to keep our dogs busy 🙂 That’s the sort of game I love, something anyone can make. Fantastic post! I love all these ideas, but I’ve never frozen treats in broth before so I’d like to try that one. Sharing. Wonderful post and great ideas. At our house we are always worn out as Mom works us out a lot and we have our sports, so we love down time to nap. Katie is a bit bored now that she is a senior and can’t walk much, doesn’t like to play games, but she just sleeps then. My Dog is very energetic, I think he’s a Labrabull or a Pitador as some call it. He has a Kong but gets bored with it after a while; because he can’t rip it to shreds. So I like to go to my recycling bin; pick up a cardboard object and throw it around the house, it’s his favourite kind of toy; it’s fun watching him go after every single piece until hes successfully ‘defeated’ it. If there’s a leftover Cream carton; I’ll stick a treat in it and watch hi try and get it out. What do you do with a puppy when you try to play and all he wants to do is jump and bite? I’d work on using the redirection method with some toys to make sure the puppy has good bite inhibition before playing any rough type games such as tug of war or wrestling. Redirection is just another way of saying “do this, not that.” My dog Laika was really bitey when she was young, and the redirection method worked pretty well. Anytime she would get too rough and bite too hard I would grab a toy and encourage her to play with that instead. If she continued to try to go after my skin with those sharp teeth I would just stop playing altogether. It didn’t take her too long to realize biting me made all the fun stop, but biting the toy meant it could keep going. How can I get my dog involved in helping with daily tasks? I saw the suggestion but HOW to do it? Do you spend anytime out in the yard or garden? One of the ways my dog loves to help out is to pull weeds for me. I’ll point to a weed & tell her to “pull,” and I also use her digging skills when we’re planting new stuff. I’ve also had her help out with doing the laundry & putting away her toys by teaching her the “pick up” cue and getting her to drop items into the laundry basket or toy box. Those are some good ideas. She already helps take slacks and socks off by grabbing and pulling :). If anyone else has more ideas, I’m all ears. My dog is not trained and he is almost 4 and he is starting to get really bored. He doesn’t live in the house so what do I do? Are you looking for training advice to help get him used to being indoors, or activities that can keep him occupied while he’s outside? Uh, where does he live? If there’s room build a fenced in run area outside – then no leash is necessary. Our boy loves to chew on empty plastic milk cartons and bat them around. There bouncy path is unpredictable so it is more interesting then just a simple ball. Make sure you watch that he doesn’t chew it to pieces. give the dog to someone else and get a cat until you can be bothered to train your dog. ………. speaking of windows, we actually had a bay window installed for them to watch outside – it has a shelf padded for them ( are we sick people?) nope! A basket loaded with toys – especially girl dog picks one out to bring to us when we come home. She also likes to jump for the toy at bedtime. She also watches TV at times. Play dogs barking on your PC ……. there are several web sites to go to for this. Nice read. Thank you for these awesome ideas. I just bought an automatic ball thrower for Ben and he started having lots of fun with his new toy! That’s awesome. I keep looking at those thinking ‘dude, that would be so sweet,’ yet I still haven’t bought one. So your dog is enjoying it already? Which one did you get? I might have to give one of those a shot. Thanks for this! This list will become invaluable in the summer months with my pooch!! 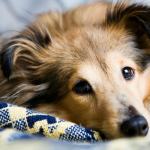 What a great list of ideas to prevent boredom in dogs! I do a lot of these already but I’d love to get some agility equipment for the yard or a nosework kit for my Husky. I’d also like to teach her to pull a wagon or cart, but safely, and give her little jobs to help me in the garden. I loved the “working for his food” part. Indeed, we tend to spoil our dogs and make their life too easy. As a matter of fact, my last dog was adopted off the streets and he knew how difficult it was back when he didn’t have a home. He was very easy to train. My current dog that I’ve adopted from someone else is kind of hard to train.. I enjoyed reading your blog, and I completely agree that dogs should be interactive with their owners. Wow, what a comprehensive list! I was already doing some of these with great success, but I definitely got a few gems from this article, thanks! Thank you so much for this list! I will definitely use them in the upcoming summer! Happy and I are already looking forward to those games! Great list with lots of fun activities both for us and our pups! I’d also like to recommend dog frisbee – it’s loads of fun and exercise for the both of you. I just figured out recently that using one of those slow feeder bowls with cut up carrots keeps my border collie entertained for a long time! He can usually get the first carrot pieces out easily but after awhile the bowl gets slippery from all the licking and the carrots are almost impossible to get out! It keeps him entertained for a good amount of time, lol. Cat trees are great for cats to relieve boredom, but not sure many people would be able to fit a dog tree in their homes!! I have always had lab mixes and they are great fetchers. I like to use one of the manual ball launchers which keeps them running and wears them out! It may just be me but it seems like they behave better if they get exercise everyday.